But Rosemary gets more than she bargained for with the Wayfarer. The crew is a mishmash of species and personalities, from Sissix, the friendly reptillian pilot, to Kizzy and Jenks, the constantly sparring engineers who keep the ship running. Life onboard is chaotic but more or less peaceful - exactly what Rosemary wants. Until the crew are offered the job of a lifetime: the chance to build a hyperspace tunnel to a distant planet. They'll earn enough money to live comfortably for years...if they survive the long trip through war-torn interstellar space without endangering any of the fragile alliances that keep the galaxy peaceful. But Rosemary isn't the only person onboard with secrets to hide, and the crew will soon discover that space may be vast, but spaceships are very small indeed. jtm (Grade: A) Wow, 5+ stars, and this one surprised me. 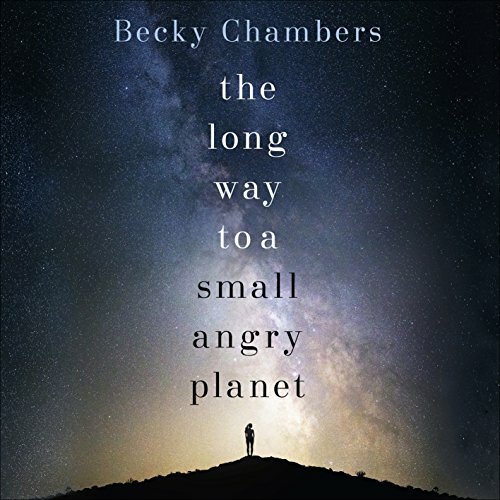 I cannot remember a cast of characters, both main and side, that are all so memorable and, for the most part, likeable as those Becky Chambers has created here. This is character-driven science fiction at its best (and it's a debut novel!). The story is set pretty far into the future and a lot of fantastical technology (FTL, wormholes, ansibles, etc.) are taken for granted (and not really explained). This isn't hard sci-fi at all. RemusLupin (Grade: B) This book was unique with a well-rounded, interesting cast of characters. However the plot was slow-moving and not very compelling, and I wish some of the relationships (particularly the interspecies ones) had more development. LeahBookishObsession (Grade: A–) I would call this a fun, laugh out loud kind of Space Opera. A character driven story with fantastically sapient-diverse characters, which is why I was reminded of Guardians of the Galaxy. With similar character descriptions and the life affirming sentiments found in Avatar. Yes there's swearing and sexual situations aplenty. Which really just added to the quirkiness of this story. It would have been beneficial to have a full-cast narration to differentiate the characters. deeronthecurve (Grade: A) Just really, really good. Can't wait for the next one. Kimmu-chan (Grade: A+) This book is to blame for my current obsession with science fiction. I picked this one up randomly and was not expecting much. But it was so much fun! The terrific cast of characters, with their own personal strengths and weaknesses, is what really made the book for me.